THE PERENNIAL CELEBRITIES of Western history are mostly all-conquering generals (Alexander, Julius Caesar, Napoleon), powerfully innovative artists (Michelangelo, Leonardo, Shakespeare, Beethoven), or revolutionary scientists (Galileo, Newton, Darwin, Einstein). The curious exception is an obscure Egyptian king of the Eighteenth Dynasty, who reigned for a bare nine years (c.1336-1327 BCE), accomplished little that we know of, and only acquired his exceptional status some 3,250 after his death, when his tomb was opened in 1922. Now, like the Titanic, Tutankhamen comes round and round, spawning exhibitions, movies, and no end of books. The purist—judging from the author’s dust-jacket profile, which boasts that one of her previous books on Ancient Egypt accompanied a major television series—might decide that this one could be given a miss. After all, Joyce Tyldesley herself remarks that “anyone who claims to be able to write a ‘warts and all’ biography of Tutankhamen is being either economical with the truth, or naïve, or, perhaps, works in television.” But the purist would be wrong. Tyldesley is a senior lecturer in Egyptology at the University of Manchester and has written no less than sixteen earlier books on different aspects of Ancient Egypt. She pays out her gripping story in meticulous but always fascinating detail, clarifies and analyzes the conflicting interpretations of the evidence, and altogether avoids the sort of simplification which she deplores in television “documentaries.” Her entertaining and demystifying discussion of the supposed “curse” on those who disturbed Tutankhamen’s tomb occupies only a single chapter. 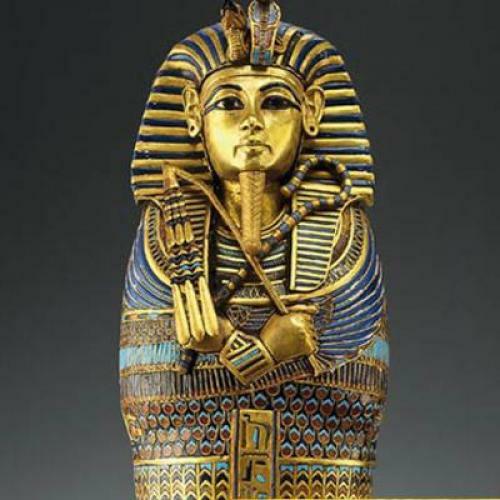 The world’s excitement about Tutankhamen began from the moment his tomb was discovered, for the simple reason that it was the first Ancient Egyptian royal tomb to be entered which had not been tampered with by grave-robbers. Tyldesley tells us why: lying under the floor of the dry river bed known as the Valley of the Kings, the tomb’s entrance was covered by the sediment from a great flood at the end of the Eighteenth Dynasty (c.1300 BCE), and over the centuries covered again and again during the periodic cloudbursts that affect the region. With most of the tombs of the Eighteenth Dynasty kings accounted for, Egyptologists were well aware that Tutankhamen’s was still to be found, but it was Howard Carter and his employer Lord Carnarvon who set about a determined clearance of the Valley floor. After six seasons of work and the removal of up to 200,000 tons of rubbish with little result, Carnarvon, the paymaster, had understandable doubts. Carter persuaded him to press on for one last season and as he too was about to give up, he uncovered a flight of steps leading down to a small blocked door. Finally, having disinterred the mummy from a further sequence of coffins within coffins, they opened the last two chambers, the treasury and the annexe—“a jumble of every kind of funerary chattels.” But it was not until the fifth season of work on the tomb, in 1926 and 1927, that this annex was cleared, long after Carnarvon had died of an infected mosquito bite in 1923 and started the story of the curse. Or rather, helped to endorse it, for it was Carter himself who, in an article for Pearson’s Magazine, told the story of his caged bird which encouraged the workmen unearthing the site with its beautiful song, until they uncovered the entrance, when it stopped singing, only to sing again when they covered the entrance again as they waited for Carnarvon to arrive from London. Then, as the entrance was opened once more and the steps revealed, news came that a cobra—the Ancient Egyptian symbol of royalty and protection, whose image decorated the King’s forehead—had killed the bird. To calm the workmen’s superstitious fears, Carter promised that their lucky bird would soon be singing again and quickly had another brought from Cairo. Tyldesley points out that this was a period when the occult was flourishing and that many nineteenth-century writers, including Poe, Gautier, Bram Stoker, and Conan Doyle had produced more or less sinister mummy tales, and she stamps firmly on the notion that there was ever a curse written over the entrance. How Tutankhamen himself came to die so young—he was probably about eighteen—remains uncertain. He was not mummified to the highest standard and his heart was missing, so perhaps he died leading his troops on some distant battlefield. It was probably not murder and it was not, as conjectured by some, tuberculosis. It could have been a simpler disease, for, as Tyldesley briskly remarks, “in Tutankhamen’s day simple diarrhoea was a killer.” She herself suggests, from the presence of a golden ostrich-feather fan in the tomb, that he may have died in a hunting accident—Egyptian kings of his time went out in chariots for the dangerous sport of chasing ostriches. Tutankhamen’s claim to the throne remains almost as obscure as his death. In a virtuoso chapter of dynastic juggling, Tyldesley tries to sort out his family connections. We know that, while still a child, he married Ankhesenamen, the third daughter of King Akhenaten and Queen Nefertiti. This might suggest to the unwary that Tutankhamen was a mere consort, but on the contrary, “princesses, in the Eighteenth Dynasty, did not marry outside the royal family; they married their brothers and half brothers and, very occasionally, their fathers, or they married no one.” So was he the son of Akhenaten or his grandson? And what relation was he to Smenkhkare, who reigned for a mere two years between the death of Akhenaten and the reign of Tutankhamen? And was Nefertiti—almost equally famous because of her beautiful bust, discovered in 1912, but not publicly displayed until 1923—the mother of Tutankhamen? There are several other candidates, among whom Tyldesley plumps for the eldest daughter of Akhenaten and Nefertiti, Meritaten, suggesting that she married Smenkhkare, her brother or half-brother, and that after his death, she acted as regent to her still very young son. There are no certainties here, and many of the names, which have several variations, are as tongue-twisting as the relationships are head-spinning. Tyldesley is kind enough to provide a chapter called “Restoration,” where she takes pity on the giddy reader and provides her own reconstruction of what might have happened at this tricky juncture in Ancient Egyptian history. Tutankhamen’s brief reign was more than a simple succession. His father or grandfather, Akhenaten, was a religious radical who discarded the traditional pantheon of gods, led by Amen, and substituted a single spirit of light, the Aten, at the same time moving his court from Thebes, the city of Amen, to a new city in Middle Egypt called Akhetaten (modern Amarna) and changing his own name from Amenhotep (“Amen is satisfied”) to Akhenaten (“Living Spirit of the Aten”). The significance of Tutankhamen’s reign was that the clock was put back from Aten to Amen and his own name changed from Tutankhaten. No doubt regretting his story of the song-bird, Carter himself, who did not die until 1939, passionately denounced the whole idea of a curse: “So far as the living are concerned curses of this nature have no part in the Egyptian Ritual.” Tyldesley comments drily “He was, of course, wasting his time,” but patiently enumerates the various theories before dismissing them. No one who reads this absorbing book will be likely to disagree, for it makes clear what her subtitle implies, that we have by no means come to the end of our discoveries of the life and times of this shadowy celebrity, whose least interesting aspect is that old Gothic fantasy of the mummy’s curse. John Spurling is a playwright and novelist. His latest novel, A Book of Liszts: Variations on the Theme of Franz Liszt, was published last year by Seagull Books.